Finding a decent loan with bad credit can feel a lot like searching for the proverbial needle in a haystack — in the dark. With a candle. Sure, you need the light, but you could set the whole thing on fire with one wrong move. Indeed, the struggle to find a loan with poor credit is two-fold; simply finding a loan can be tough, but the real trick is finding a loan that won’t be so expensive that it puts you in more financial trouble. For short-term loans, the right solution will depend on how long you’ll need to repay the loan. If you need 30 days or less, consider a credit card, rather than a loan. For longer-term loans, installment typically beats cash advance, but each has its pros and cons. If you only need to finance a purchase for a few weeks, then using a credit card may be the ideal solution. Most credit cards offer what’s known as a grace period, which is the time between when your statement closes and the due date for that billing cycle. So long as you pay off your entire statement balance before the end of the grace period, you won’t be charged any interest on that balance. The typical grace period is between 20 and 25 days, giving you around three weeks of interest-free financing every month. When you have poor credit, one of the biggest problems with using a credit card’s grace period for free short-term financing is that some subprime credit cards won’t actually offer a grace period for new purchases. So, you’ll need to be careful to read any card’s terms and conditions to see if it comes with a grace period to avoid interest. In general, the best rates and fees will be with a secured credit card. Although not ideal for immediate use, secured cards can still make good reusable financing options. At the same time, a little research can also uncover several unsecured options with decent grace periods — just don’t carry a balance on these high-APR cards. While this secured credit card does require a deposit to open, qualified applicants may not need to put down 100% of the minimum credit line. Plus, the card comes with a solid 25-day grace period that works well for reusable short-term, interest-free financing of smaller purchases. This card has a fairly competitive APR for a subprime card, plus it offers a full 25-day grace period on interest fees for new purchases, making it a solid choice for very short-term financing. Keep in mind that the annual fee will be charged when you open your account, reducing your initial available credit until you pay it off. This card’s regular APR is no joke, making it a poor choice for carrying a balance. However, the card’s 21-day grace period and flexible credit requirements make it a decent option for short-term financing of small purchases. While most business credit cards that will approve bad-credit applicants will be secured cards, they can still be a worthwhile investment for reusable short-term financing that you can rely on during periods of sporadic revenue. Additionally, if you have poor personal credit but good business credit, you may have a better chance of being approved for a business credit card with favorable terms than for a similar consumer credit card. Either way, choose a card known to have broad credit requirements. If your credit score is on the border of fair and bad, this card may be a valid option. This is one of the only unsecured business credit cards from a big bank that offers flexible credit requirements. Of course, if approved, the credit limit you’re offered will still depend on your credit risk. The Wells Fargo Business Secured Credit Card is a secured credit card that will require a minimum deposit of $500 to open and maintain, though you can place a deposit of up to $25,000 for a larger credit line. This card offers a decent APR for a credit-builder card, as well as providing a 21-day grace period during which you won’t be charged interest so long as your full balance is repaid. As an added bonus, the card earns purchase rewards in the form of unlimited cash back on every purchase. The BBVA Secured Visa® Business Credit Card requires a minimum $500 deposit to open and maintain, but you can make a larger deposit for a higher credit limit. Your limit will be equal to 90% of your deposit. This card has a competitive purchase APR, though it does charge a high penalty APR if you make late payments. This has a grace period on the shorter end with an interest-free period of at least 20 days after the close of the billing cycle. This card is only available in Alabama, Florida, Texas, Arizona, Colorado, California, and New Mexico. Once you carry a credit card balance past the grace period, that balance will start accruing interest (unless you have an active 0% APR offer, of course). This makes credit cards less-than-ideal for financing purchases for more than a few weeks, meaning a loan may be a better fit. However, installment loans tend to have minimum terms of at least three months, so for shorter-term financing, you should still consider a credit card. But, if you can’t use your credit cards for some reason, a short-term cash advance loan may be an option. Unlike a traditional loan, short-term cash advance loans are typically repaid in a single lump sum that includes both the principal and all applicable fees. Many short-term cash advance loans charge finance fees based on the amount borrowed. For example, a $500 loan may cost $20 for every $100 borrowed, or a total of $100 in fees. Because the fees are so high for short-term cash advance loans, it’s recommended that you explore your options before choosing a lender. An online lending network, like those below, can help qualified applicants find and compare multiple offers at once. This network works with a variety of lenders to provide a range of loans for many credit types, including borrowers with bad credit. Loans can be obtained in amounts as large as $1,000. You’ll need a minimum $1,000 monthly income and at least 90 days at your current job. Qualified borrowers can receive loans of up to $2,500 from the lenders in this network, though NY borrowers are out of luck. You’ll need to make at least $800 a month to qualify for a loan through a Money Mutual partner lender, though this can be through a job or another source of regular income. Whether you rely on daily customer sales or quarterly invoices, it can be hard to stay on track when revenue is sometimes sporadic at best. But despite the fact that your business is its own entity, your personal credit can still get in the way of finding the business funding you need. Thankfully, a growing company that meets the required revenue standards can still find short-term business financing to get through the lean months despite having an owner with less-than-perfect personal credit. Fundera is a full-service small business financial organization that offers a wide variety of business loans and financing options. Fundera’s short-term loans are available to a range of credit types, including those with bad credit, though the typical Fundera borrower had a credit score around 600. 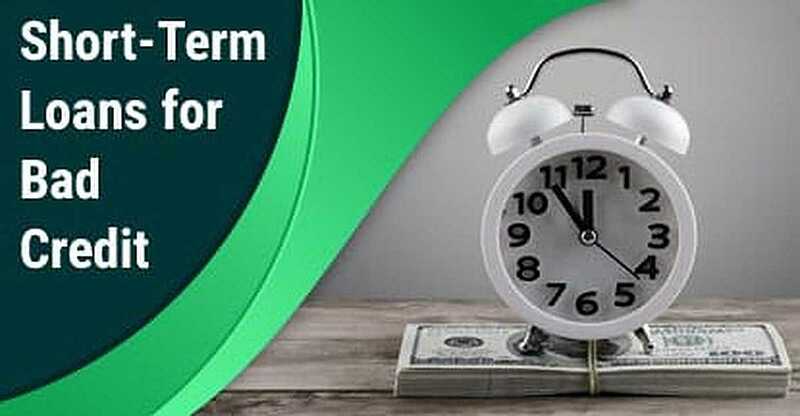 To apply for a short-term loan from Fundera, you can fill out the quick online application. You’ll generally need to provide your business’s bank statement and tax returns, as well as your personal credit score. Funding can be obtained in as little as two days. OnDeck is an online lender that specializes in business loans, including fixed-term loans and lines of credit. OnDeck has fairly flexible credit requirements for its short-term loans, requiring at least one owner to have a personal credit score of 500 or higher. You can apply for a short-term OnDeck loan online. You’ll need to have been in business for at least one year and have an annual gross revenue of $100,000 or more to qualify for a loan. Repayments are made in fixed daily or weekly payments that are automatically deducted from your business bank account. Although credit cards can be a good option for very-short-term financing, once you need a four-digit amount or need more than a month or two to repay the debt, credit cards aren’t really your best option. And the high cost of short-term cash advance loans makes them a pricey pick no matter what. Personal installment loans, on the other hand, are a good combination of variable term lengths — many come with terms as short as three months, or as long as several years — and high maximum loan amounts. And if you use a flexible lender, bad credit shouldn’t be an impossible impediment. Installment loans have a lot of benefits, not the least of which is that you can repay them through smaller, regular payments, rather than needing to repay a huge lump sum all at once. Personal installment loans also tend to have much lower interest rates than cash advance loans, or even some subprime credit cards. Of course, you should still shop around to see if you can find the best rate. An online lending network, such as our picks below, can be a good way to receive multiple loan offers without having to fill out multiple applications. This lending network specializes in helping bad-credit borrowers find the personal installment loans they need. Term lengths range from three months up to 60 months, and loans are available in amounts of $500 up to $5,000. Lenders from this network can help a range of credit types, including borrowers with bad credit. Loans are available in amounts from $2,000 up to $35,000, though only the most well-qualified applicants will likely be approved for the highest amounts. Qualified borrowers can use this lending network to find loans of $1,000 up to $35,000. Term lengths will vary by lender but typically range from three months up to 72 months. Most loan agreements require just an e-signature to complete and funding can be obtained in as little as 24 hours. Perhaps one of the best things about many types of business loans is that your company’s revenue and business credit history will be just as — if not significantly more — important than your personal credit profile (though good personal credit can go a long way). Keep in mind that your business will typically need to meet set income and length of operation requirements, with many lenders preferring applicants who have been in business at least one year. Finding a needle in a haystack may be difficult by hand — but a good magnet can change the game. When it comes to finding a decent short-term loan when you have a low credit score, choosing the right lender can make all the difference. But not all lenders are the same. Don’t run off with the first lender to say “yes” — be sure to investigate the lender’s reputation and consumer reviews to ensure you’re doing business with a respectable company.